Despite being an important channel for end-user assistance, few studies have directly investigated the interactions that occur in modern-day practice of software product support. We present results from a multi-dimensional analysis of product support activities at a leading design software company. We carried out a quantitative analysis of existing support requests, a survey with product support specialists, and follow-up interviews to understand the current practices in product support. In particular, we investigated the utility of different multimedia formats that modern web-based support systems enable. 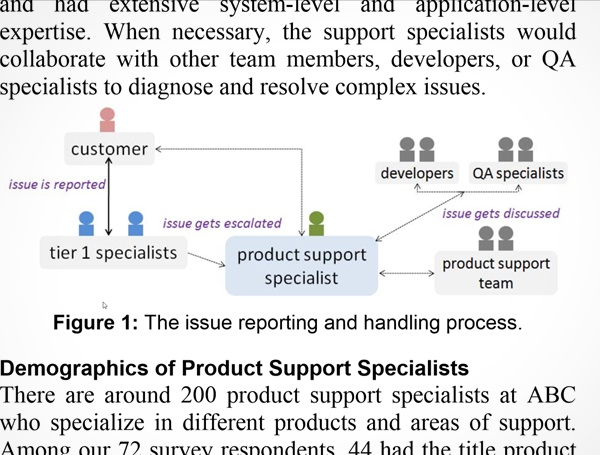 Our results showed that despite the value that these formats bring to support tasks, support specialists still face bottlenecks in remotely resolving software problems. We conclude by highlighting several opportunities in HCI for improving diagnosis and resolution of software issues over the web.